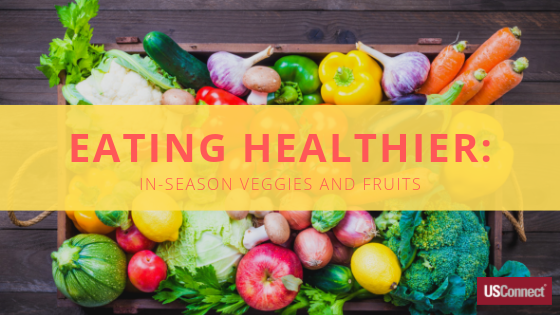 One way to become healthier is to improve the quality of the nutrients you consume by eating locally grown, in-season fruits and vegetables. In-season being the time of year when a fruit or vegetable is usually harvested, is at its peak ripeness, and is most plentiful. You may see fruits and other produce in your grocery store during all seasons of the year, but much of the time, it has been shipped from a distance—even other countries—where it may have been many days since it was harvested, and it also may have questionable nutrient value. Flavor. The flavor is more intense: Freshly harvested produce just tastes better than produce even a few days older. Think of biting into a fresh, crisp apple that is so fresh it squirts its juices with each bite, or a fresh peach which gives off its inviting smell before you even bite into it. Higher-quality nutrients. Produce picked before it ripens does not have enough time in the sun for the nutrients to fully develop in the flesh of the fruit or vegetable. In-season fruits and vegetables have a higher vitamin C content which lowers the risk of infections, unlike the infection risks from the pesticides and preservatives in canned and processed foods. Canned fruits and vegetables rapidly lose anti-oxidants like vitamin C, folate, and carotenes when they sit on store shelves, but freshly picked ones are loaded with these health-giving substances. Price. Seasonal produce and fruits are in abundant supply, so the price per pound is less—making it not only better for you but also cheaper. For non-seasonal produce shipped from other places such as California and Mexico, the shipping cost is passed along to the purchaser, resulting in higher prices. Transported produce must be picked before ripening, chilled during transportation to prevent rotting, and upon arriving at its destination, possibly heated in a hothouse to artificially ripen, which changes the texture and taste as well as greatly reducing the nutrients. Avoiding Contaminates. Because of the stringent regulations on food grown in the United States, we can feel safe consuming foods grown here (and if there is an outbreak caused by foods grown in some areas, we are notified and told to return or throw out the named food). However, many countries overseas (from which some of our vegetables and fruits are sourced) have very relaxed laws concerning chemicals that are sprayed on crops grown there. They may not conduct or regulate soil contamination tests to ensure safe ground in which to grow fruits and vegetables. In some of these agricultural areas, heavy metals and other toxic contaminates have been found coming from industrial sites located in or near the same areas. Community. Most communities have a farmer’s market or food co-op, and these are not only great places to get the freshest of in-season produce, but you can also talk with the farmers who produce these foods and learn about the methods they use. It is a plus to be able to support farmers who work so hard to provide healthy foods for the community and to help build connections which benefit everyone. If you don’t have the time to visit a farmer’s market, you can often find some locally sourced produce at your grocery store. Many stores will even have it labeled as locally grown. Another option is to invest in a CSA (Community Supported Agriculture). Before harvesting time, you pay a lump sum to a local farm or group of regional farms. This gives you a “share,” which means that you receive weekly boxes of locally harvested and ultra-fresh produce. This arrangement is mutually beneficial since the farmer has improved cash flow to help with harvesting, and the share owner is guaranteed delicious and fresh produce from a known safe source. A study from Johns Hopkins University and a recent one from the CDC (Centers for Disease Control) found that only 11 percent of adults consumed the recommended daily servings of vegetables and fruit. But more than half exceeded their daily need for protein and grains and ate excessive amounts of sugar, saturated fats, and salt. All of us need to improve on the amount of fruits and vegetables we eat daily to become healthier. Eating in-season produce can help us to achieve that goal. Click here and enter your state in the drop-down at the top of the page to see what fruits and vegetables are in-season in your area.